One of the best things about the cooler weather is the return of hot, comforting stews back into my diet. The other day I had a craving for pork bone soup and ended up at Makkal Chon as we were running errands in the east end. The restaurant is located in a small strip plaza at Lawrence and Warden in Scarborough. We arrived at 5:45 on a Saturday evening and while we were able to get a table right away, the restaurant quickly filled up and by the time we left, there were several groups waiting. So if you come during peak hours, you can expect to wait. 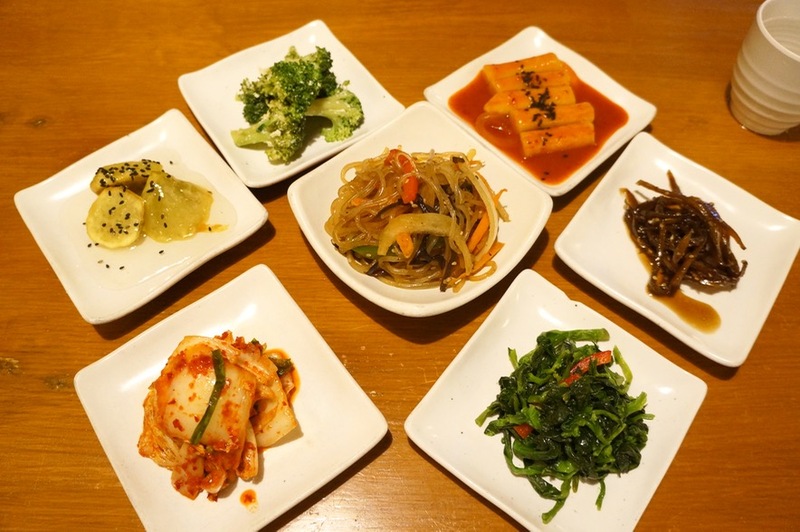 After ordering, our server brought us some Banchan, small complimentary side dishes typically given at Korean restaurants. With a selection of seven dishes, this was one of the best spreads I’ve seen. 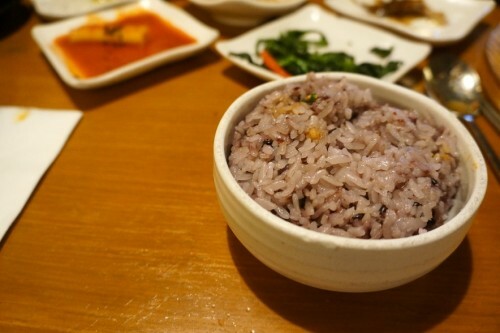 At most other Korean restaurants I’ve been to, we usually get three or four dishes. The banchan here consisted of spicy rice cakes (my favourite! ), japchae (glass noodles), a broccoli salad, candied root vegetable, candied root (not sure what this was exactly… our server described it as some sort of root), spinach and kimchi. 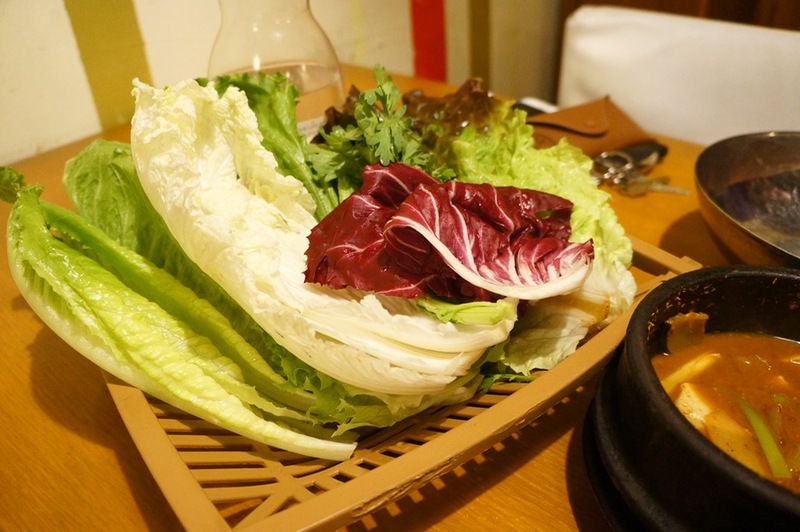 The vegetable wraps (aka ssam) seem to be the most popular thing to order at Makkal Chon – nearly every other table at the restaurant ordered this. We decided to go with Combo A – Basic vegetable wraps + two choices of meat ($29.99) which is meant to feed two people. They also offer a Combo B which includes a choice of three meat dishes and is meant to feed three. 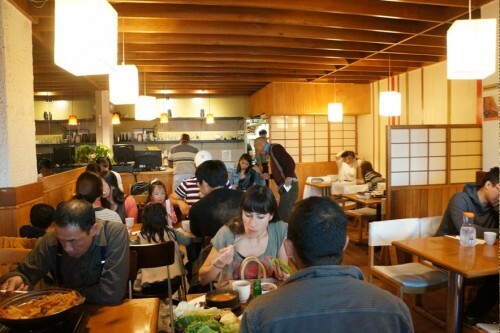 Meat choices include bulgogi, chicken teriyaki, spicy chicken, mackerel, spicy pork, grilled pork and spicy squid & pork. The combos come with a soybean paste stew and two (or three for combo b) bowls of purple rice. 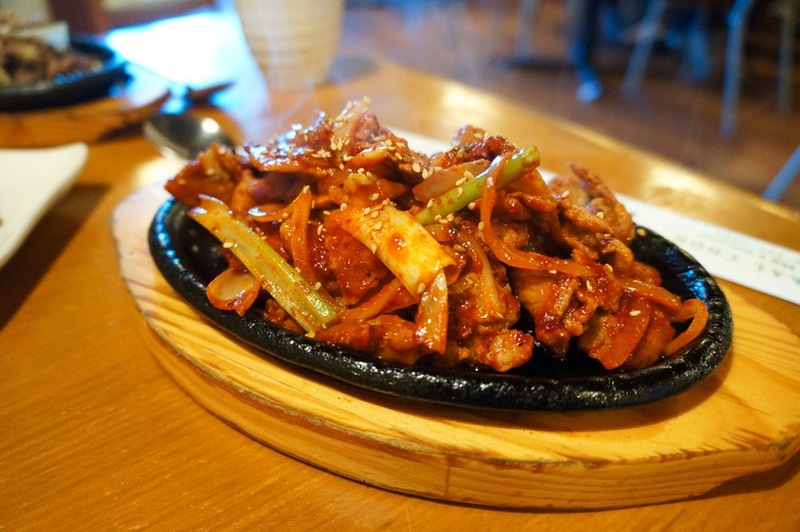 We decided to go with the Bulgogi and Spicy Pork, both of which arrive on a sizzling hot plate. 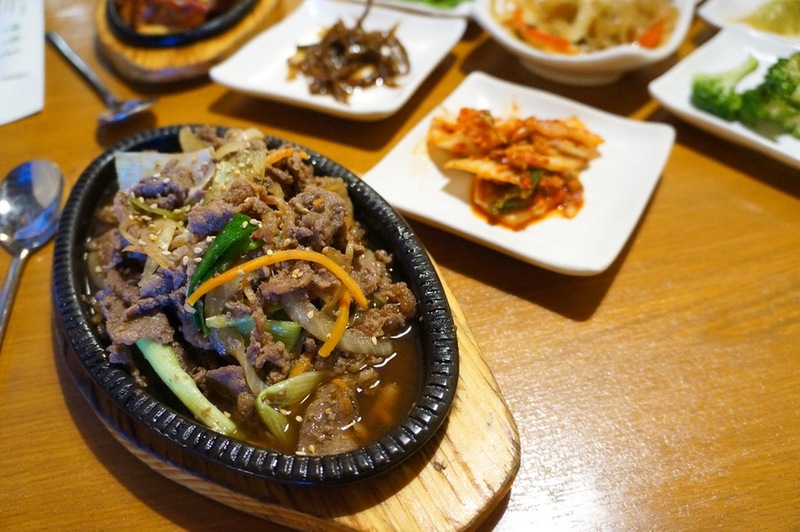 We really enjoyed both options but if I had to choose, I’d give a slight edge to the bulgogi. Despite how bright red the spicy pork looked, it was surprisingly mild. Not too spicy at all. I have a moderate spice tolerance and I was able to easily eat this. When they brought out the sizzling plates of meat, we assumed the vegetable wraps would be following but we waited around for a while and finally, after asking about it did they bring it out. By that time, the meat wasn’t as hot as I would’ve liked. It seemed like they were a little understaffed. Anyway, they provided a variety of different lettuces which were all quite fresh – no unpleasant wilted greens in the bunch. The wraps were accompanied by ssamjang dipping sauce (a Korean sauce often eaten with grilled meat) which tastes like bean paste with a bit of spice added to it. 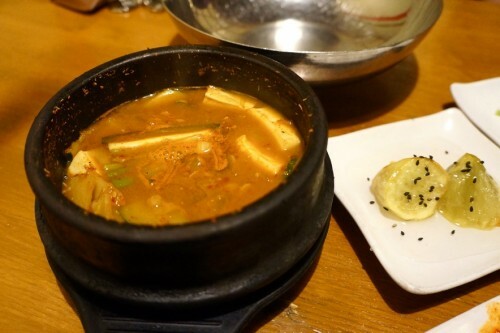 The Soybean Paste Stew which came with the combo arrived piping hot and was incredibly flavourful with an intense soybean flavour. 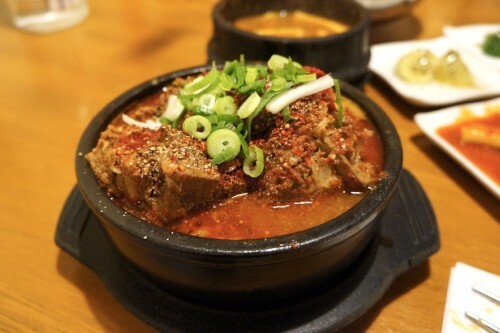 In addition to the combo, we ordered the Pork Bone Soup ($10.99). Makkal Chon’s pork bone soup is on the pricier side – at $11 it’s not going to break the bank but it’s a couple bucks more than the average Korean restaurant. It’s well worth the small premium though. The pieces of pork bones had a ton of meat on them and the pork just fell off the bones so you don’t need to work very hard for it. Often times, the bones don’t have very much meat on them so you need to put in a tremendous amount of effort for a minuscule amount of pork. The broth here was excellent. It was packed full of spice and had a very intense flavour that was so comforting on a cold day. The menu indicates that you can ask for their dishes to be less spicy. We ordered the default broth and found it to be fairly spicy. We arrived at the restaurant starving so it’s no surprise we over-ordered. The combo would have been more than enough food for us but we ended up with some delicious leftovers for the next day, so no regrets! 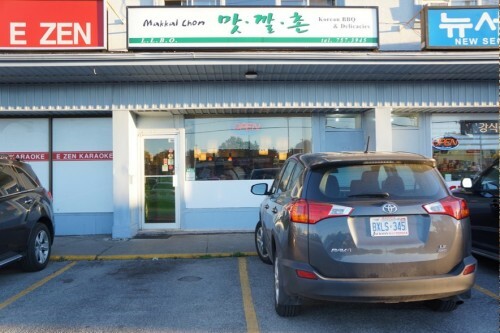 If you’ve got a craving for Korean food, Makkal Chon is definitely worth the drive out to Scarborough.